J. B. JESSOP (East Ham) Ltd, Builders Merchant. A family run business, established in 1931 with an emphasis on customer care. Your one-stop shop for ALL your building and plumbing materials. Come and visit our newly refurbished kitchen showrooms. We have over 30 years experience in the kitchen trade. We are able to supply something for every need. Come and visit our newly refurbished bathroom showrooms. We have over 30 years experience in the bathroom trade. We are able to supply something for every need. J. 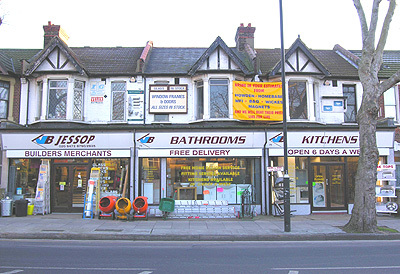 B. JESSOP (East Ham) Ltd, Builders Merchant, was established in 1931. We are a family run business with an emphasis on customer care. We are your one-stop shop for ALL your building and plumbing materials. We’re pleased to serve you, we serve to please you. We offer FREE local delivery on all in-store orders over £10.00 and can provide same-day delivery (where possible) on all other orders. Most areas can be reached with our fleet of vehicles, including a hiab (crane) for those heavy loads. In our East Ham shop, you will find all the tools, fixings, materials, workwear, protection and paints plus our Kitchen & Bathroom departments. You will find all your hardware needs including pipes, guttering, tubing, fittings, traps, drainage pumps, water tanks, glass etc. You will find all your building needs including timber, fencing, posts, sand, cement, aggregates, paving, bricks, cobbles, blocks etc. You will find exactly what you are looking for in one of our 5 main departments. Here are just a few comments from our long list of satisfied customers. Good Morning, We would just like to say that we are really pleased with the bathroom suite that you supplied us, thanks for all your help. Hi to all at Jessops, Many thanks for my early delivery of garden slabs, a great service. Laurence from Jessops came round, he measured and planned our kitchen and we got an extra 50% discount. I have just bought our kitchen from J. B. Jessop and wanted to thank you all for the great service throughout. To all the staff at JB Jessop, Thank you so much, We searched the B&Q website and in store for a bathroom suite for our house. We couldn't find anything that would fit into the space we had available, so on our way home we popped into Jessops and they had exactly what we were looking for. We were stuck with what to do with our garden, so we went to Jessops for some help. They advised us with all that we needed and delivered it all, the same afternoon. We supply the best quality tools, appliances and brands avaiable on the market. We can always source items if not immediately available. Give us a call or email us and see if we can help with your next project.